The aggregate market value of the Registrant’s voting and non-voting stock held by non-affiliates was approximately $1.9 billion based on the last sales price of the Registrant’s Common Stock on the NASDAQ Global Market of the NASDAQ Stock Market LLC on June 30, 2015. For purposes of this calculation, shares of Common Stock held by directors, officers and 10% stockholders known to the Registrant have been deemed to be owned by affiliates which should not be construed to indicate that any such person possesses the power, direct or indirect, to direct or cause the direction of the management or policies of the Registrant or that such person is controlled by or under common control with the Registrant. As of November 1, 2016, the Registrant had 20,900,189 shares of Common Stock outstanding. Portions of the Proxy Statement for the Registrant’s 2015 Annual Meeting of Stockholders to be filed with the Commission on or before April 29, 2016 are incorporated by reference in Part III of this Annual Report on Form 10-K. With the exception of those portions that are specifically incorporated by reference in this Annual Report on Form 10-K, such Proxy Statement shall not be deemed filed as part of this Report or incorporated by reference herein. Ligand Pharmaceuticals Incorporated (“the Company”) is filing this Amendment on Form 10-K/A (“Amended Form 10-K”) to its Annual Report on Form 10-K for the fiscal year ended December 31, 2015 (the “Original Form 10-K”), which was originally filed with the Securities and Exchange Commission (“SEC”) on February 26, 2016 (the “Original Filing Date”), to reflect restatement of financial statements ("Restatement") described below. For the convenience of the reader, this Annual Report on Form 10-K/A sets forth the Original Form 10-K, in its entirety, as amended by and to reflect the Restatement. This Amended Form 10-K to amends Part II, Item 6 "Selected Consolidated Financial Data", Item 7. “Management’s Discussion and Analysis of Financial Condition and Results of Operations”, Item 8. “Consolidated Financial Statements and Supplementary Data”, and Item 9A "Controls and Procedures" to correct errors relating to the Company's net operating loss (NOL) carryforward benefits in the United States which resulted in an overstatement of deferred tax assets (DTA) at December 31, 2015. In connection with three acquisitions that were completed prior to February 2010, the Company recognized DTA for a portion of the NOLs, which included capitalized research and development expenses, obtained from the acquired businesses. From the time of the acquisitions until September 2015, there was a full valuation allowance against all of the Company’s NOLs, including those obtained from the entities acquired. In September 2015, the Company concluded that the valuation allowance against substantially all of its DTA was no longer required based on its then recent income and projections of sustained profitability. As a result, the Company released its DTA valuation allowance in full, including $27.5 million related to NOLs recognized as part of the businesses acquired prior to February of 2010. During the quarter ended September 30, 2016, the Company concluded that for accounting purposes the approximately $27.5 million of DTA that were obtained upon acquiring the businesses prior to February of 2010 did not meet the more likely-than-not criterion for recognition in 2015 and that the related valuation allowance should not have been reversed. In reviewing its prior-year accounting as part of the 2016 third quarter close process, the Company re-evaluated its accounting for income taxes with the assistance of additional third-party tax professionals and determined that the Company's income tax benefit and net income for the year ended December 31, 2015 were overstated by $27.5 million each. The Company also corrected errors as part of this Restatement relating to the classification of our 2019 Convertible Senior Notes. As of December 31, 2015, the Company's last reported sale price exceeded the 130% threshold described in Note 5 - "Financing Arrangements" and accordingly the 2019 Convertible Senior Notes have been reclassified as a current liability as of December 31, 2015. As a result, the related unamortized discount of $39.6 million was classified as temporary equity component of currently redeemable convertible notes on our Consolidated Balance Sheet. Notes payable of $205.3 million has been reclassified from long term debt to short term debt and the related unamortized discount of $39.6 million has been classified as temporary equity. This Amended Form 10-K also revises the Company’s disclosure under the heading "Evaluation of Disclosure Controls and Procedures” and “Management’s Report on Internal Control over Financial Reporting” in Item 9A for the material weaknesses relating to this Restatement, includes the updated attestations of our independent registered public accounting firm and includes currently-dated certifications from the Company’s Chief Executive Officer and Chief Financial Officer, as required by Sections 302 and 906 of the Sarbanes-Oxley Act of 2002. In order to preserve the nature and character of the disclosures set forth in the Original Report, except as expressly noted above, this Amended Form 10-K speaks as of the date of the filing of the Original Report, February 26, 2016, and we have not updated the disclosures in the Amended Form 10-K to speak as of a later date. All information contained in this Amended Report is subject to updating and supplementing as provided in our reports filed with the Securities and Exchange Commission subsequent to the date of the Original Report. Information not affected by the Restatement is unchanged and reflects the disclosures made as of the Original Filing Date. In particular, forward-looking statements included in this Amended Form 10-K that have not been affected by the Restatement represent management’s views as of the Original Filing Date. Such forward-looking statements should not be assumed to be accurate as of any future date. Accordingly, this Amended Form 10-K should be read in conjunction with our subsequent filings with the SEC, as information in such filings may update or supersede certain information contained in this Amended Form 10-K. The financial information previously disclosed in the Company’s consolidated financial statements included in the Original Form 10-K (and other SEC filings in which such financial statements were included) and the Company’s unaudited interim condensed consolidated financial statements previously included in the Company’s Quarterly Reports on Form 10-Q for the quarterly and year to date periods ended September 30, 2015 should not be relied upon. The unaudited condensed consolidated financial statements for the three and nine months ended September 30, 2015 and the related disclosures in Management’s Discussion and analysis on financial condition and results of operations will not be restated on Form 10-Q/A but will be restated on Form 10-Q for the period ended September 30, 2016. In connection with the Restatement, the unaudited condensed consolidated financial statements for the three months ended March 31, 2016 and the three and six months ended June 30, 2016 and the related disclosures will be restated on Forms 10-Q/A for those respective periods. Sedor Pharmaceuticals, Inc., or RODES, Inc.
You should read the following together with the more detailed information regarding our company, our common stock and our financial statements and notes to those statements appearing elsewhere in this document or incorporated by reference. Forward-looking statements can be identified by the use of forward-looking words such as “believes,” “expects,” “may,” “will,” “plan,” “intends,” “estimates,” “would,” “continue,” “seeks,” “pro forma,” or “anticipates,” or other similar words (including their use in the negative), or by discussions of future matters such as those related to our royalties and milestones under license agreements, Capitsol materials sales, and product development, as well as other statements that are not historical. You should be aware that the occurrence of any of the events discussed under the caption “Risk Factors” could negatively affect our results of operations and financial condition and the trading price of our stock. Our trademarks, trade names and service marks referenced herein include Ligand®, Captisol®, Captisol-enabled™, LTP technology™, OmniAb®, OmniMouse®, OmniRat® and OmniFlic®. All other trademarks, trade names and service marks including Conbriza®, Duavee®, Kyprolis®, Premarin®, Promacta®, Revolade®, SUREtechnology Platform™, and Viviant® are the property of their respective owners. Use or display by us of other parties’ trademarks, trade dress or products is not intended to and does not imply a relationship with, or endorsement or sponsorship of, us by the trademark or trade dress owners. We are a biopharmaceutical company focused on developing and acquiring technologies that help pharmaceutical companies discover and develop medicines. Over our more than 25 year history, we have employed research technologies such as nuclear receptor assays, high throughput computer screening, formulation science, liver targeted pro-drug technologies and antibody discovery technologies to assist companies in their work toward securing prescription drug approvals. We currently have partnerships and license agreements with over 85 pharmaceutical and biotechnology companies, and over 140 different programs under license with us are currently in various stages of commercialization and development. We have contributed novel research and technologies for approved medicines that treat cancer, osteoporosis, fungal infections and low blood platelets, among others. Our partners have programs currently in clinical development targeting seizure, coma, cancer, diabetes, cardiovascular disease, muscle wasting, liver disease, and kidney disease, among others. We have over 500 issued patents worldwide, and over 300 currently pending patent applications. We have assembled our large portfolio of fully-funded programs either by licensing our own proprietary drug development programs, licensing our platform technologies such as Captisol or OmniAb to partners for use with their proprietary programs, or acquiring existing partnered programs from other companies. Fully-funded programs are those for which our partners pay all of the development and commercialization costs. For our internal programs, we generally plan to advance drug candidates through early-stage drug development or clinical proof-of-concept. On December 5, 2015, Amgen announced The Lancet Oncology published results from the Phase 3 ENDEAVOR clinical trial evaluating Kyprolis plus dexamethasone versus Velcade (bortezomib) plus dexamethasone showing that patients with relapsed multiple myeloma treated with Kyprolis lived twice as long without their disease worsening. Melinta announced positive results from a Phase 3 study to evaluate delafloxacin against vancomycin + aztreonam for the treatment of patients with ABSSSI. SAGE announced initiation of a Phase 3 study designed to evaluate the safety of SAGE-547 in patients with SRSE. SAGE also announced SAGE-547 demonstrated a 77% response rate in evaluable patients with SRSE in a Phase 1/2 clinical trial. Spectrum published results from the pivotal clinical study for EVOMELA in the journal Biology of Blood and Marrow Transplantation. FDA approved Promacta for the treatment of children six years and older with chronic immune thrombocytopenia who have had an insufficient response to corticosteroids, immunoglobulins or splenectomy. The European Commission approved Revolade (Promacta) for the treatment of adults with acquired SAA who were either refractory to prior immunosuppressive therapy or heavily pretreated and are unsuitable for hematopoietic stem cell transplantation. On January 21, 2016, Amgen announced that the FDA approved Kyprolis in combination with dexamethasone for the treatment of patients with relapsed or refractory multiple myeloma who have received one to three lines of therapy. The FDA also approved Kyprolis as a single agent for the treatment of patients with relapsed or refractory multiple myeloma who have received one or more lines of therapy, converting to full approval the initial accelerated approval Kyprolis received in July 2012 as a single agent. On November 19, 2015, Amgen announced the EC approval of Kyprolis in combination with lenalidomide and dexamethasone for the treatment of adult patients with multiple myeloma who have received at least one prior therapy. Zydus Cadila announced the approval and launch of Exemptia, a biosimilar of adalimumab, in India. Ligand gained rights to royalties on sales of Exemptia in the April 2013 Selexis royalty acquisition. Worldwide agreement with Sanofi for SAR-125844, a Captisol-enabled program. Clinical-stage agreement with AiCuris GmbH & Co for an undisclosed anti-infective Captisol-enabled program. Expanded global license and supply agreements with SAGE to cover the use of Captisol in the development and commercialization of SAGE-689. License and supply agreement with Vireo Health for use of Captisol in the development and commercialization of cannabinoid-based medications. Global license and supply agreements with RODES, Inc. (now known as Sedor) for intramuscular (IM)/IV meloxicam, IM/IV fosphenytoin, and intranasal budesonide. Commercial supply agreement with Gilead Sciences to supply Captisol for use in developing a Captisol-enabled program directed against Ebola virus disease. Clinical use agreement with XTL Biopharmaceuticals to supply Captisol for use in in the formulation of its lead drug, hCDR1, for the treatment of systemic lupus erythematosus. License agreement with Sermonix Pharmaceuticals for the development and commercialization of oral lasofoxifene in the U.S. and additional territories. Ligand acquired OMT in January 2016, conferring ownership of a large portfolio of licenses and the OmniAb platform, for $178 million in cash and stock. Ligand acquired financial rights to more than 15 additional development stage programs from Selexis for $4 million in cash. Ligand announced results from a Phase 1b trial of LGD-6972 that demonstrated favorable safety, tolerability and pharmacokinetics in normal healthy volunteers and in subjects with type 2 diabetes mellitus. The trial results also demonstrated a robust, dose-dependent reduction of fasting plasma glucose. In connection with the Viking IPO, Ligand received an equity milestone of 3.4 million shares and invested an additional $9.0 million in the offering. Key programs licensed to Viking include VK5211 (SARM), VK2809/VK0214 (TRβ), VK0612 (FBPase), EPOR and DGAT-1. A variety of technology platforms that enable elements of drug discovery or development form the basis of our portfolio of fully-funded shots on goal. Platform technologies or individual drugs discovered by Ligand are related to a broad estate of intellectual property that includes over 500 issued patents and over 300 pending patent applications. Captisol is Ligand’s patented, uniquely-modified cyclodextrin that is specifically designed to maximize safety, while improving the solubility, stability and bioavailability of APIs. Captisol can enable faster and more efficient development paths for our partners, given its known regulatory acceptance. Ligand maintains both Type IV and Type V DMFs with the FDA. These DMFs contain manufacturing and safety information relating to Captisol that our licensees can reference when developing Captisol-enabled drugs. Ligand also filed a DMF in Japan in 2015. Captisol-enabled drugs are marketed in more than 60 countries, and over 45 partners have Captisol-enabled drugs in development. In January of 2016, Ligand acquired OMT and the OmniAb Technologies. OmniAb includes three complementary and globally-branded platforms named OmniRat, OmniMouse and OmniFlic. The OmniAb platforms consist of genetically-engineered transgenic rodents that produce a broadly diversified repertoire of antibodies and enable novel fully-human antibody drug discovery and development by our OmniAb partners. Fully-human OmniAb antibodies provide advantages to our partners in that fully-human antibodies have reduced immunogenicity, streamline development timelines and costs, and accelerate novel antibody discovery. Currently, more than 18 partners are utilizing OmniAb animals in their drug discovery and development efforts. The LTP Technology platform is a novel prodrug technology designed to selectively deliver a broad range of pharmaceutical agents to the liver. A prodrug is a biologically inactive compound that can be metabolized in the body to produce an active drug. The LTP Technology works by chemically modifying biologically active molecules into an inactive prodrug, which will be administered to a patient and later activated by specific enzymes in the liver. The technology can be used to improve the safety and/or activity of existing drugs, develop new agents to treat certain liver-relayed diseases, and treat diseases caused by imbalances of circulating molecules that are controlled by the liver. The technology is especially applicable to metabolic and cardiovascular indications, among others. Currently 3 partners are utilizing the LTP Technology or related platform(s). Ligand acquired economic rights to over 30 SUREtechnology Platform programs from Selexis in two separate transactions in 2013 and 2015, granting Ligand rights to downstream economics on novel biologics and biosimilars programs. The SUREtechnology Platform, developed and owned by Selexis, is a novel technology that improves the way that cells are utilized in the development and manufacturing of recombinant proteins and drugs. The technology is based on novel DNA-based elements that control the dynamic organization of chromatin within mammalian cells and allow for higher and more stable expression of recombinant proteins. The technology creates advantages over traditional approaches including accelerated development and manufacturing times, high yields and increased compound stability. The following table lists our disclosed partners and licensees. In addition to these 70 Companies, we have over 15 additional undisclosed partners and licensees, mostly biotech companies. We have a large portfolio of current and future potential revenue-generating programs, over 140 of which are fully-funded by our partners. In addition to the table below, we also have more than 40 undisclosed programs. We have multiple programs under license with other companies that have products that are already being commercialized. The following programs represent components of our current portfolio of revenue-generating assets and potential for near-term growth in royalty and other revenue. For information about the royalties owed to Ligand for these programs, see “Royalties” later in this business section. Promacta is currently approved for three indications: (1) the treatment of thrombocytopenia in patients with ITP who have had an insufficient response to corticosteroids, immunoglobulins or splenectomy, (2) Hepatitis-C associated thrombocytopenia and (3) SAA. Promacta was initially approved in 2008, and the product has been generating royalty revenue for Ligand since 2009. Promacta is known as Revolade in the EU and other non-US markets. Novartis has been and continues to pursue globalization of the brand and currently markets Promacta in multiple countries for the three approved indications. Specifically, ITP is currently approved in more than 100 countries, the Hepatitis C-related indication is currently approved in more than 50 countries, and the SAA indication is approved in more than 30 counties. Beyond the currently-approved indications, Novartis is also performing development activities to expand the brand into new indications, including a number of oncology-related indications including MDS, AML and CIT. As of February 2016, there are 42 open clinical trials related to Promacta (listed as recruiting or open, and not yet recruiting) on the clinicaltrials.gov website. We are entitled to receive royalties related to Promacta during the life of the relevant patents or at a reduced rate for ten years from the first commercial sale, whichever is longer, on a country-by-country basis. Novartis has listed a patent in the FDA’s, Orange Book for Promacta with an expiration date in 2027, and absent early termination for bankruptcy or material breach, the term of the agreement expires upon expiration of the obligation to pay royalties. There are no remaining milestones to be paid under the agreement. Kyprolis is also approved in Argentina, Israel, Kuwait, Mexico, Thailand, Columbia, Korea, Canada and the European Union. Kyprolis was initially approved in the U.S. in 2012, and Amgen continues to invest significantly in Kyprolis to further expand its label and geography. Amgen’s obligation to pay royalties does not expire until four years after the expiration of the last-to-expire patent covering Captisol. Our patents and applications relating to the Captisol component of Kyprolis are not expected to expire until 2033. Our agreement with Amgen may be terminated by either party in the event of material breach or bankruptcy, or unilaterally by Amgen with prior written notice, subject to certain surviving obligations. Absent early termination, the agreement will terminate upon expiration of the obligation to pay royalties. Under this agreement, we are entitled to receive remaining milestones of up to $2.3 million, revenue from clinical and commercial Captisol material sales and royalties on annual net sales of Kyprolis. Pfizer is marketing bazedoxifene under the brand names Viviant and Conbriza in various territories for the treatment of postmenopausal osteoporosis. Pfizer is responsible for the registration and worldwide marketing of bazedoxifene, a synthetic drug specifically designed to reduce the risk of osteoporotic fractures while also protecting uterine tissue. Pfizer has combined bazedoxifene with the active ingredient in Premarin to create Duavee, a combination therapy for the treatment of post-menopausal symptoms in women. Duavee is approved in the United States and it is anticipated that it will be marketed under the brand name Duavive in the EU. Net royalties on annual net sales of Viviant/Conbriza and Duavee/Duavive are each payable to us through the life of the relevant patents or ten years from the first commercial sale, whichever is longer, on a country by country basis. Our partner, Zydus Cadila’s Exemptia (adalimumab biosimilar) is marketed in India for autoimmune diseases. Zydus Cadila uses the Selexis technology platform for Exemptia. We are entitled to earn royalties on sales by Zydus Cadila through at least 2026. Our partner, Zydus Cadila’s Vivitra (trastuzumab biosimilar) is marketed in India for breast cancer. Zydus Cadila uses the Selexis technology platform for Vivitra. We are entitled to earn royalties on sales by Zydus Cadila through at least 2026. We have multiple fully-funded partnered programs that are either in or nearing the regulatory approval process, or given the area of research or value of the license terms are considered particularly noteworthy. We are eligible to receive milestone payments and royalties off of these programs. For information about the royalties owed to Ligand for these programs, see “Royalties” later in this Business Overview section. In the case of Captisol-related programs, we are also eligible to receive revenue for the sale of Captisol material supply. We have a license agreement with Spectrum related to Evomela, which is a Captisol-enabled melphalan IV formulation. In December 2014, Spectrum submitted a NDA to the FDA. In October 2015, Spectrum announced that it had received a complete response letter from the FDA requiring additional information regarding its contract manufacturers. Spectrum has indicated that next FDA action date is May 2016. Evomela is intended for use in the multiple myeloma stem cell transplant setting, and has been granted Orphan Designation by the FDA. The Evomela formulation avoids the use of propylene glycol, which has been reported to cause renal and cardiac side-effects that limit the ability to deliver higher quantities of therapeutic compounds. The use of the Captisol technology to reformulate melphalan is anticipated to allow for longer administration durations and slower infusion rates, potentially enabling clinicians to safely achieve a higher dose intensity of pre-transplant chemotherapy. agreement and royalties on future net sales of the Captisol-enabled melphalan product. Spectrum’s obligation to pay royalties will expire at the end of the life of the relevant patents or when a competing product is launched, whichever is earlier, but in no event within ten years of the commercial launch. Our patents and applications relating to the Captisol component of melphalan are not expected to expire until 2033. Absent early termination, the agreement will terminate upon expiration of the obligation to pay royalties. The agreement may be terminated by either party for an uncured material breach or unilaterally by Spectrum by prior written notice. Our partner, Merck is conducting two Phase 3 trials for Verubecestat (MK-8931), a BACE inhibitor for the treatment of Alzheimer’s disease. Alzheimer’s disease is characterized by plaques of amyloid-beta protein within the brain. BACE is believed to be a key enzyme in the production of amyloid-beta protein. Amyloid-beta is formed when the larger amyloid precursor protein is cleaved by two enzymes, BACE and gamma-secretase, which releases the amyloid-beta fragment. A BACE inhibitor is expected to reduce amyloid-beta generation in Alzheimer’s disease patients. Merck expects initial data from Phase 3 trials in mid-2017. We are entitled to a royalty on potential future sales by Merck. Merck is responsible for all development costs related to the program. Our partner, SAGE, is conducting a Phase 3 clinical trial for the development of Captisol-enabled therapeutics for a broad range of debilitating central nervous system conditions. SAGE’s lead clinical program, Captisol-enabled SAGE-547 is an allosteric modulator of both synaptic and extra-synaptic GABAA receptors that is in clinical development as an adjunctive therapy, a therapy combined with current therapeutic approaches, for the treatment of SRSE. SAGE-547 was granted Fast Track designation, which is intended to facilitate the development and expedite the review of drug candidates that are intended to treat serious or life-threatening conditions and demonstrate the potential to address unmet medical needs, and orphan drug designation, which is intended to facilitate drug development for rare diseases, by the FDA for SRSE. Ligand has the potential to receive milestone payments, royalties and revenue from Captisol material sales for Captisol-enabled programs. SAGE is responsible for all development costs related to the program. Our partner Retrophin is currently conducting a Phase 2 clinical trial for the development of Sparsentan for orphan indications of severe kidney diseases including FSGS. Certain patient groups with severely compromised renal function exhibit extreme proteinuria resulting in progression to dialysis and a high mortality rate. Sparsentan, with its unique dual blockade of angiotensin and endothelin receptors, is expected to provide meaningful clinical benefits in mitigating proteinuria in indications where there are no approved therapies. In January 2015, the FDA granted Sparsentan orphan drug designation. Under our license agreement with Retrophin we are entitled to receive potential net milestones of over $75 million in the future and net royalties on future worldwide sales by Retrophin through the life of the relevant patents, which we currently expect to be through at least 2019 and may be extended until 2024. Retrophin is responsible for all development costs related to the program. Our partner Melinta is currently completing Phase 3 clinical trials for the development of Baxdela, a Captisol-enabled delafloxacin-IV. Delafloxacin is a novel hospital-focused fluoroquinolone antibiotic candidate with potency against a variety of quinolone-resistant Gram-positive and Gram-negative bacteria, including quinolone-resistant MRSA. In 2015, Melinta reported positive top-line results on the first of two planned Phase 3 clinical trials of delafoxacin for the treatment of ABSSSI, including infections caused by MRSA. Under the terms of the agreement, we may be entitled to up to $3.6 million of development and regulatory milestones, a royalty on potential future sales by Melinta, and revenue from Captisol material sales. Melinta is responsible for all development costs related to the program. to a request of CMC data from the FDA’s Complete Response Letter received in late 2014. Under the terms of our agreement with Lundbeck, we may be entitled to development and regulatory milestones, royalties on potential future sales by Lundbeck and revenue from Captisol material sales. Lundbeck is responsible for all development costs related to the program. Our partner Viking is developing VK5211, a novel, potentially best-in-class SARM for patients recovering from hip-fracture. SARMs retain the beneficial properties of androgens without undesired side-effects of steroids or other less selective androgens. Viking initiated a Phase 2 trial in hip fracture in 2015. Under the terms of the agreement with Viking, we may be entitled to up to $270 million of development, regulatory and commercial milestones and tiered royalties on potential future sales. Viking is developing VK2809, a novel selective TR-β agonist with potential in multiple indications, including hypercholesterolemia, dyslipidemia, NASH, and X-ALD. Viking intends to initiate a Phase 2 trial for VK2809 in hypercholesterolemia and fatty liver disease in 2016. Under the terms of the agreement with Viking, we may be entitled to up to $375 million of development, regulatory and commercial milestones and tiered royalties on potential future sales. Our partner, TG Therapeutics is developing our IRAK-4 inhibitors. The IRAK-4 program is in preclinical development for potential use in certain cancers and autoimmune diseases. Under the terms of the agreement we are eligible to receive $207 million in potential milestone payments. We are also eligible to receive royalties on future net sales of licensed products containing patented IRAK-4 inhibitors. TG Therapeutics will be responsible for all development costs related to the program. The FDA granted our partner, CURx, orphan-drug designation for a proprietary Captisol-enabled Topiramate Injection formulation for the treatment of partial onset or primary generalized tonic-clonic seizures in hospitalized epilepsy patients who are unable to take oral topiramate. Under the terms of our agreement, CURx may be required to pay us an aggregate of $19.6 million, net of amounts owed to third parties upon the achievement of specified milestones. Additionally, we are owed net royalties on future sales. CURx will be responsible for all development costs related to the program. Our partner Azure is developing a novel formulation of lasofoxifene. Under the terms of our agreement with Azure, we are entitled to receive up to $2.6 million in potential development and regulatory milestones as well as royalties on future net sales through the later of the life of the relevant patents (currently expected to be at least until 2027) or 10 years after regulatory approval. Azure may terminate the license agreement at any time upon six months’ prior notice. Lasofoxifene is an estrogen partial agonist for osteoporosis treatment and other diseases, discovered through the research collaboration between us and Pfizer. Under the terms of the license agreement with Azure, we retained the rights to the oral formulation of lasofoxifene originally developed by Pfizer. Our partner, Ethicor has an agreement with us for the manufacture and distribution of the oral formulation of lasofoxifene in the European Economic Area, Switzerland and the Indian Subcontinent. Under the terms of the agreement, we are entitled to receive potential sales milestones of up to $16 million and royalties on future net sales. Ethicor plans to supply oral lasofoxifene as an unlicensed medicinal product, which may be requested by healthcare professionals to meet the clinical needs of patients when authorized medicines are unsuitable or contraindicated. Our partner, Sermonix has a license for the development of oral lasofoxifene for the United States and additional territories. Under the terms of the agreement, we are entitled to receive up to $45 million in potential regulatory and commercial milestone payments and royalties on future net sales. Our partner, Sanofi licensed Captisol for use in the development of Captisol-enabled SAR-125844, a potent MET kinase inhibitor. Under the terms of the agreement, we are eligible to receive potential milestone payments, royalties on future net sales and revenue from Captisol material sales. Sanofi will be responsible for all development costs related to the program. SAR-125844 is a potent, selective and reversible ATP-competitive MET tyrosine kinase inhibitor for IV administration. SAR-125844 recently completed a first-in-human, open-label, non-randomized, single agent, Phase 1 study in advanced/refractory solid tumor patients. Our partner, Coherus Biosciences is conducting Phase 3 / BLA-enabling clinical trials for CHS-0214 (etanercept biosimilar) for rheumatoid arthritis. Coherus uses the Selexis’ technology platform for CHS-0214. We are entitled to earn regulatory and sales milestones, and royalties on potential future sales through at least 2026. Our partner, Cardioxyl (acquired by BMS in 2015) is conducting Phase 2 clinical trials for Captisol-enabled CXL-1427 (nitroxyl donor prodrug) for ADHF. Under the terms of the agreement, we may be entitled to development and regulatory milestones, and royalties on potential future sales by BMS and revenue from Captisol material sales. Our partner, Eli Lilly is conducting Phase 2 clinical trials for Captisol-enabled LY2606368 (Chk 1/2 inhibitor) for solid tumors. Under the terms of the agreement, we may be entitled to regulatory milestones, royalties on potential future sales by Eli Lilly and revenue from Captisol material sales. Our partner, Deciphera Pharmaceuticals is currently conducting Phase 1 trials for the development of Altiratinib for the treatment of solid tumors. Altiratinib is a Captisol-enabled MET/TIE2/VEGF2/TRK (A,B,C) kinase inhibitor. Under the terms of the clinical-stage agreement, we may be entitled to development milestones from Deciphera and revenue from Captisol material sales. Our partner, Merrimack Pharmaceuticals is currently conducting a Phase 2/3 trial for the treatment of advanced metastatic HER2-positive breast cancer. MM-302 is an antibody-drug conjugated liposomal doxorubicin that was developed using the Selexis SUREtechnology Platform. Under the terms of the agreement, we may be entitled to development and commercial milestones, royalties on potential future sales. Our partner, VentiRx is currently conducting Phase 2 trials for the development of Motolimod for the treatment of ovarian cancer and head and neck cancer. Motolimod is a Captisol-enabled Toll-like Receptor 8 agonist. Motolimod was granted Fast Track and Orphan Designations by the FDA for the treatment of recurrent or persistent ovarian cancer. VentiRx has an exclusive worldwide collaboration with Celgene to develop VTX-2337. Under the terms of the clinical-stage agreement, we have earned development milestones from VentiRx and revenue from Captisol material sales. Our partner, Millennium/Takeda is currently conducting Phase 2 trials for the development of Pevonedistat for the treatment of hematological malignancies and solid tumors. Pevonedistat is a Captisol-enabled Nedd8-Activating Enzyme Inhibitor. Under the terms of the clinical-stage agreement, we may be entitled to development milestones from Millennium/Takeda and revenue from Captisol material sales. We are currently developing a small molecule glucagon receptor antagonist for the treatment of Type 2 diabetes mellitus. Compounds that block the action of glucagon may reduce the hyperglycemia that is characteristic of the disease. Glucagon stimulates the production of glucose by the liver and its release into the blood stream. In diabetic patients, glucagon secretion is abnormally elevated and contributes to hyperglycemia in these patients. We conducted a Phase 1b trial showing robust effects throughout multiple ascending dosing, and plan to initiate a Phase 2 clinical trial in 2016. We currently have no manufacturing facilities and rely on a third party, Hovione, for Captisol production. Hovione is a global supplier with over 50 years of experience in the development and manufacture of APIs and Drug Product Intermediates. Hovione operates FDA-inspected sites in the United States, Macau, Ireland and Portugal. Manufacturing operations for Captisol are currently performed in both of Hovione's Portugal and Ireland sites with distribution operations also performed from Hovione's Portugal and Ireland sites. We have ongoing minimum purchase commitments under the agreement and are required to pay Hovione an aggregate minimum amount during the agreement term. In the event of a Captisol supply interruption, we are permitted to designate and, with Hovione’s assistance, qualify one or more alternate suppliers. If the supply interruption continues beyond a designated period, we may terminate the agreement. In addition, if Hovione cannot supply our requirements of Captisol due to an uncured force majeure event or if the unit price of Captisol exceeds a set figure, we may obtain Captisol from a third party. Some of the drugs we and our licensees are developing may compete with existing therapies or other drugs in development by other companies. Furthermore, academic institutions, government agencies and other public and private organizations conducting research may seek patent protection with respect to potentially competing products or technologies and may establish collaborative arrangements with our competitors. Existing or potential competitors to our licensee’s products, particularly large pharmaceutical companies, may have greater financial, technical and human resources than our licensees. Accordingly, these competitors may be better equipped to develop, manufacture and market products. Many of these companies also have extensive experience in preclinical testing and human clinical trials, obtaining FDA and other regulatory approvals and manufacturing and marketing pharmaceutical products. Patents covering Promacta are owned by Novartis. The United States patent listed in the FDA’s Orange Book relating to Promacta with the latest expiration date is not expected to expire until 2027. Six months of additional exclusivity has been granted due to pediatric studies conducted by GSK. The type of patent protection (e.g., composition of matter or use) for each patent listed in the Orange Book and the expiration date for each patent listed in the Orange Book are provided in the following table. In addition, certain related patents in the commercially important jurisdictions of Europe and Japan are identified in the following table. ‡Expiration dates of European and Japanese patents are calculated as 20 years from the earliest nonprovisional filing date to which priority is claimed, and do not take into account extensions that are or may be available in these jurisdictions. expiration dates for each patent listed in the Orange Book are provided in the following table. In addition, certain related patents in the commercially important jurisdictions of Europe and Japan are identified in the following table. Patents and pending patent applications covering Captisol are owned by Ligand. Other patents and pending patent applications covering methods of making Captisol are owned by Ligand or by Pfizer. The patents covering the Captisol product, if issued, with the latest expiration date would not be set to expire until 2033 (see, e.g., WO 2013/130666 (contains composition of matter and use claims; filed Feb. 27, 2013)). Ligand also owns several patents and pending patent applications covering drug products containing Captisol as a component. The type of patent protection (e.g., composition of matter or use) and the expiration dates for several issued patents covering Captisol are provided in the following table. In addition, certain related patents and applications in the commercially important jurisdictions of Europe and Japan are listed in the following table. ‡ Expiration date of European and Japanese patents are calculated as 20 years from the earliest nonprovisional filing date to which priority is claimed, and do not take into account extensions that are or may be available in these jurisdictions. OMT has received patent protection in 27 countries, including the United States, multiple countries throughout Europe, Japan and China (see selected cases listed in the table below) and has 19 patent applications pending worldwide. The patents and applications owned by OMT are expected to expire between 2028 and 2033 and partners are able to use the OMT patented technology to generate novel antibodies, which may be entitled to additional patent protection. Patent applications related to our LTP Technology include three families owned by Ligand and one owned by Omthera. Each of these patent families include claims directed to composition of matter and use. Patents resulting from these applications, if granted, would have a latest expiration date in 2036. Patents and pending patent applications covering LGD-6972 are owned by Ligand. Patents covering LGD-6972, if issued, with the latest expiration date would not be set to expire until 2035 (see, e.g., WO 2015/191900 (contains composition of matter and use claims; filed June 11, 2015)). The type of patent protection (e.g., composition of matter or use) and the expiration dates for several issued patents covering LGD-6972 are provided in the following table. In addition, certain related patents and applications in the commercially important jurisdictions of Europe and Japan are listed in the following table. As of February 1, 2016, we had 21 full-time employees, of whom seven are involved directly in scientific research and development activities. the information contained in our website and in the SEC’s website is not intended to be a part of this filing. Information related to the operation of the SEC’s public reference room may be obtained by calling the SEC at 800-SEC-0330. Future revenue based on Promacta and Kyprolis, as well as sales of our other products, may be lower than expected. Novartis is obligated to pay us royalties on its sales of Promacta, and we receive revenue from Amgen based on both sales of Kyprolis and purchases of Captisol material for clinical and commercial uses. These payments are expected to be a substantial portion of our ongoing revenues for some time. In addition, we receive revenues based on sales of Duavee, Conbriza, Noxafil IV and Nexterone. Any setback that may occur with respect to any of our products, and in particular Promacta or Kyprolis, could significantly impair our operating results and/or reduce the market price of our stock. Setbacks for the products could include problems with shipping, distribution, manufacturing, product safety, marketing, government regulation or reimbursement, licenses and approvals, intellectual property rights, competition with existing or new products and physician or patient acceptance of the products, as well as higher than expected total rebates, returns, discounts, or unfavorable exchange rates. These products also are or may become subject to generic competition. Any such setback could reduce our revenue. Future revenue from sales of Captisol material to our collaborative partners may be lower than expected. Revenues from sales of Captisol material to our collaborative partners represent a significant portion of our current revenues. Any setback that may occur with respect to Captisol could significantly impair our operating results and/or reduce the market price of our stock. Setbacks for Captisol could include problems with shipping, distribution, manufacturing, product safety, marketing, government regulation or reimbursement, licenses and approvals, intellectual property rights, competition with existing or new products and physician or patient acceptance of the products using Captisol, as well as higher than expected total rebates, returns or discounts for such products. If products or product candidates incorporating Captisol technology were to cause any unexpected adverse events, the perception of Captisol safety could be seriously harmed. If this were to occur, we may not be able to market Captisol products unless and until we are able to demonstrate that the adverse event was unrelated to Captisol, which we may not be able to do. Further, whether or not the adverse event was a result of Captisol, we could be required by the FDA to submit to additional regulatory reviews or approvals, including extensive safety testing or clinical testing of products using Captisol, which would be expensive and, even if we were to demonstrate that the adverse event was unrelated to Captisol, would delay the marketing of Captisol-enabled products and receipt of revenue related to those products, which could significantly impair our operating results and/or reduce the market price of our stock. We obtain Captisol from a sole source supplier, and if this supplier were to cease to be able, for any reason, to supply Captisol to us in the amounts we require, or decline to supply Captisol to us, we would be required to seek an alternative source, which could potentially take a considerable length of time and impact our revenue and customer relationships. We maintain inventory of Captisol, which has a five year shelf life, at three geographically dispersed storage locations in the United States and Europe. If we were to encounter problems maintaining our inventory, such as natural disasters, at one or more of these locations, it could lead to supply interruptions. We currently depend on our arrangements with our outlicensees to sell products using our Captisol technology. These agreements generally provide that outlicensees may terminate the agreements at will. If our outlicensees discontinue sales of products using our Captisol technology, fail to obtain regulatory approval for products using our Captisol technology, fail to satisfy their obligations under their agreements with us, or choose to utilize a generic form of Captisol should it become available, or if we are unable to establish new licensing and marketing relationships, our financial results and growth prospects would be materially affected. Furthermore, we maintain significant accounts receivable balances with certain customers purchasing Captisol materials, which may result in the concentration of credit risk. We generally do not require any collateral from our customers to secure payment of these accounts receivable. If any of our major customers were to default in the payment of their obligations to us, our business, financial condition, operating results and cash flows could be adversely affected. Further, under most of our Captisol outlicenses, the amount of royalties we receive will be reduced or will cease when the relevant patent expires. Our high purity patents and foreign equivalents, are not expected to expire until 2029 and our morphology patents and foreign equivalents, are not expected to expire until 2025, but the initially filed patents relating to Captisol expired starting in 2010 in the United States and will expire by 2016 in most countries outside the United States. If our other intellectual property rights are not sufficient to prevent a generic form of Captisol from coming to market and if in such case our outlicensees choose to terminate their agreements with us, our Captisol revenue may decrease significantly. The manufacture, use or sale of our potential products or our collaborative partners' products or potential products may infringe the patent rights of others. If others obtain patents with conflicting claims, we may be required to obtain licenses to those patents or to develop or obtain alternative technology. We may not be able to obtain any such licenses on acceptable terms, or at all. Any failure to obtain such licenses could delay or prevent us from pursuing the development or commercialization of our potential products. Any conflicts with the patent rights of others could significantly reduce the coverage of our patents or limit our ability to obtain meaningful patent protection. For example, our European patent related to Agglomerated forms of Captisol was limited during an opposition proceeding, and the rejection of our European patent application related to High Purity Captisol is currently being appealed. In addition, any determination that our patent rights are invalid may result in early termination of our agreements with our collaborative partners and could adversely affect our ability to enter into new collaborations. We also rely on unpatented trade secrets and know-how to protect and maintain our competitive position. We require our employees, consultants, collaborative partners and others to sign confidentiality agreements when they begin their relationship with us. These agreements may be breached, and we may not have adequate remedies for any breach. In addition, our competitors may independently discover our trade secrets. ownership rights to intellectual property, know-how or technologies developed with our collaborators. Such disputes or litigation could adversely affect our rights to one or more of our product candidates and could delay, interrupt or terminate the collaborative research, development and commercialization of certain potential products, create uncertainty as to ownership rights of intellectual property, or could result in litigation or arbitration. The occurrence of any of these problems could be time-consuming and expensive and could adversely affect our business. Before we or our partners obtain the approvals necessary to sell any of our unpartnered assets or partnered programs, we must show through preclinical studies and human testing that each potential product is safe and effective. We and/or our partners have a number of partnered programs and unpartnered assets moving toward or currently awaiting regulatory action. Failure to show any product's safety and effectiveness could delay or prevent regulatory approval of a product and could adversely affect our business. The drug development and clinical trials process is complex and uncertain. For example, the results of preclinical studies and initial clinical trials may not necessarily predict the results from later large-scale clinical trials. In addition, clinical trials may not demonstrate a product's safety and effectiveness to the satisfaction of the regulatory authorities. A number of companies have suffered significant setbacks in advanced clinical trials or in seeking regulatory approvals, despite promising results in earlier trials. The FDA may also require additional clinical trials after regulatory approvals are received. Such additional trials may be expensive and time-consuming, and failure to successfully conduct those trials could jeopardize continued commercialization of a product. The speed at which we and our partners complete our scientific studies and clinical trials depends on many factors, including, but not limited to, our ability to obtain adequate supplies of the products to be tested and patient enrollment. Patient enrollment is a function of many factors, including the size of the patient population, the proximity of patients to clinical sites, the eligibility criteria for the trial and other potential drug candidates being studied. Delays in patient enrollment for our or our partners’ trials may result in increased costs and longer development times. In addition, our collaborative partners have rights to control product development and clinical programs for products developed under our collaborations. As a result, these collaborative partners may conduct these programs more slowly or in a different manner than expected. Moreover, even if clinical trials are completed, we or our collaborative partners still may not apply for FDA approval in a timely manner or the FDA still may not grant approval. Our drug development programs may require substantial additional capital to complete successfully, arising from costs to: conduct research, preclinical testing and human studies; establish pilot scale and commercial scale manufacturing processes and facilities; and establish and develop quality control, regulatory, marketing, sales and administrative capabilities to support these programs. While we expect to fund our research and development activities from cash generated from royalties and milestones from our partners in various past and future collaborations to the extent possible, if we are unable to do so, we may need to complete additional equity or debt financings or seek other external means of financing. These financings could depress our stock price. If additional funds are required to support our operations and we are unable to obtain them on terms favorable to us, we may be required to cease or reduce further development or commercialization of our products, to sell some or all of our technology or assets or to merge with another entity. Our OmniAb antibody platform faces specific risks, including the fact that no drug using antibodies from the platform has been tested in clinical trials. None of our collaboration partners using our OmniAb antibody platform have tested drugs based on the platform in clinical trials and, therefore, none of our OmniAb collaboration partners’ drugs have received FDA approval. If one of our OmniAb collaboration partners’ drug candidates fails during preclinical studies or clinical trials, our other OmniAb collaboration partners may decide to abandon drugs using antibodies generated from the OmniAb platform, whether or not attributable to the platform. All of our OmniAb collaboration partners may terminate their programs at any time without penalty. In addition, our OmniRat and OmniFlic platforms, which we consider the most promising, are covered by two patents within the U.S. and two patents in the European Union and are subject to the same risks as our patent portfolio discussed above, including the risk that our patents may infringe on third party patent rights or that our patents may be invalidated. Further, we face significant competition from other companies selling human antibody-generating rodents, especially mice which compete with our OmniMouse platform, including the VelocImmune mouse, the AlivaMab mouse and the Trianni mouse. Many of our competitors have greater financial, technical and human resources than we do and may be better equipped to develop, manufacture and market competing antibody platforms. As is common in our industry, our partners and we face an inherent risk of product liability as a result of the clinical testing of our product candidates in clinical trials and face an even greater risk for commercialized products. Although we are not currently a party to product liability litigation, if we are sued, we may be held liable if any product or product candidate we develop causes injury or is found otherwise unsuitable during product testing, manufacturing, marketing or sale. Regardless of merit or eventual outcome, liability claims may result in decreased demand for any product candidates or products that we may develop, injury to our reputation, discontinuation of clinical trials, costs to defend litigation, substantial monetary awards to clinical trial participants or patients, loss of revenue and the inability to commercialize any products that we develop. We have product liability insurance that covers our clinical trials up to a $10.0 million annual limit. If we are sued for any injury caused by our product candidates or any future products, our liability could exceed our total assets. We may acquire companies, businesses and products that complement or augment our existing business. We may not be able to integrate any acquired business successfully or operate any acquired business profitably. Integrating any newly acquired business could be expensive and time-consuming. Integration efforts often take a significant amount of time, place a significant strain on managerial, operational and financial resources and could prove to be more difficult or expensive than we predict. The diversion of our management's attention and any delay or difficulties encountered in connection with any future acquisitions we may consummate could result in the disruption of our on-going business or inconsistencies in standards and controls that could negatively affect our ability to maintain third-party relationships. Moreover, we may need to raise additional funds through public or private debt or equity financing, or issue additional shares, to acquire any businesses or products, which may result in dilution for stockholders or the incurrence of indebtedness. We may be subject to prosecution for violation of federal law due to our agreement with Vireo Health, which is developing drugs using cannabis. In November 2015, we entered into a license agreement and supply agreement with Vireo Health granting Vireo Health an exclusive right in certain states within the United States and certain global territories to use Captisol in Vireo’s development and commercialization of pharmaceutical-grade cannabinoid-based products. However, state laws legalizing medical cannabis use are in conflict with the Federal Controlled Substances Act, which classifies cannabis as a schedule-I controlled substance and makes cannabis use and possession illegal on a national level. The United States Supreme Court has ruled that it is the Federal government that has the right to regulate and criminalize cannabis, even for medical purposes, and thus Federal law criminalizing the use of cannabis preempts state laws that legalize its use. The Obama administration has effectively stated that it is not an efficient use of resources to direct Federal law enforcement agencies to prosecute those lawfully abiding by state-designated laws allowing the use and distribution of medical and recreational cannabis. Yet, there is no guarantee that the current policy and practice will not change regarding the low-priority enforcement of Federal laws in states where cannabis has been legalized. Any such change in the Federal government’s enforcement of Federal laws could result in Ligand, as the supplier of Captisol, to be charged with violations of Federal laws which may result in significant legal expenses and substantial penalties and fines. We have restated prior consolidated financial statements, which may lead to possible additional risks and uncertainties, including possible loss of investor confidence. As a result of the Restatement, we have become subject to possible additional costs and risks, including (a) accounting and legal fees incurred in connection with the Restatement and (b) a possible loss of investor confidence. We have identified material weaknesses in our internal control over financial reporting that, if not remediated, could result in additional material misstatements in our financial statements. We are developing and implementing a remediation plan to address the material weaknesses. If our remediation efforts are insufficient or if additional material weaknesses in our internal control over financial reporting are discovered or occur in the future, our consolidated financial statements may contain material misstatements and we could be required to restate our financial results, which could materially and adversely affect our business, results of operations and financial condition, restrict our ability to access the capital markets, require us to expend significant resources to correct the material weakness, subject us to fines, penalties or judgments, harm our reputation or otherwise cause a decline in investor confidence. Our shareholder rights plan, concentration of ownership and charter documents may hinder or prevent change of control transactions. Our shareholder rights plan and provisions contained in our certificate of incorporation and bylaws may discourage transactions involving an actual or potential change in our ownership. In addition, our Board of Directors may issue shares of common or preferred stock without any further action by the stockholders. Our directors and certain of our institutional investors, collectively beneficially own a significant portion of our outstanding common stock. We have in the past granted waivers to investors allowing them to increase their ownership level above the limit set forth in our shareholder rights agreement. Such restrictions, circumstances and issuances may have the effect of delaying or preventing a change in our ownership. If changes in our ownership are discouraged, delayed or prevented, it would be more difficult for our current Board of Directors to be removed and replaced, even if you or our other stockholders believe that such actions are in the best interests of us and our stockholders. Our business is increasingly dependent on critical, complex and interdependent information technology systems, including internet-based systems, to support business processes as well as internal and external communications. Despite the implementation of security measures, our internal computer systems and those of our collaborative partners are vulnerable to damage from cyber-attacks, computer viruses, security breaches, unauthorized access, natural disasters, terrorism, war and telecommunication and electrical failures. System failures, accidents or security breaches could cause interruptions in our operations, could lead to the loss of trade secrets or other intellectual property, could lead to the public exposure of personal information of our employees and others, and could result in a material disruption of our clinical and commercialization activities and business operations, in addition to possibly requiring substantial expenditures to remedy. To the extent that any disruption or security breach were to result in a loss of, or damage to, our data or applications, or inappropriate disclosure of confidential or proprietary information, we could incur liability and our business and financial condition could be harmed. We sold the 2019 Convertible Senior Notes, which may impact our financial results, result in the dilution of existing stockholders, and restrict our ability to take advantage of future opportunities. In August of 2014, we sold $245.0 million aggregate principal amount of 0.75% Convertible Senior Notes due 2019, or the 2019 Convertible Senior Notes. We will be required to pay interest on the 2019 Convertible Senior Notes until they come due or are converted, and the payment of that interest will reduce our net income. The sale of the 2019 Convertible Senior Notes may also affect our earnings per share figures, as accounting procedures require that we include in our calculation of earnings per share the number of shares of our common stock into which the 2019 Convertible Senior Notes are convertible. The 2019 Convertible Senior Notes may be converted, under the conditions and at the premium specified in the 2019 Convertible Senior Notes, into cash and shares of our common stock, if any (subject to our right to pay cash in lieu of all or a portion of such shares). If shares of our common stock are issued to the holders of the 2019 Convertible Senior Notes upon conversion, there will be dilution to our shareholders equity. Upon the occurrence of certain circumstances, holders of the 2019 Convertible Senior Notes may require us to purchase all or a portion of their notes for cash, which may require the use of a substantial amount of cash. If such cash is not available, we may be required to sell other assets or enter into alternate financing arrangements at terms that may or may not be desirable. The existence of the 2019 Convertible Senior Notes and the obligations that we incurred by issuing them may restrict our ability to take advantage of certain future opportunities, such as engaging in future debt or equity financing activities. The total purchase price pertaining to our acquisitions in recent years of CyDex, Metabasis, Pharmacopeia, and Neurogen have been allocated to net tangible assets, identifiable intangible assets, in-process research and development and goodwill. To the extent the value of goodwill or identifiable intangible assets or other long-lived assets become impaired, we will be required to incur material charges relating to the impairment. Any impairment charges could have a material adverse impact on our results of operations and the market value of our common stock. Our common stock has experienced significant price and volume fluctuations and may continue to experience volatility in the future. Many factors may have a significant impact on the market price of our common stock, including, but not limited to, the following factors: results of or delays in our preclinical studies and clinical trials; the success of our collaboration agreements; publicity regarding actual or potential medical results relating to products under development by us or others; announcements of technological innovations or new commercial products by us or others; developments in patent or other proprietary rights by us or others; comments or opinions by securities analysts or major stockholders; future sales of our common stock by existing stockholders; regulatory developments or changes in regulatory guidance; litigation or threats of litigation; economic and other external factors or other disaster or crises; the departure of any of our officers, directors or key employees; period-to-period fluctuations in financial results; and price and volume fluctuations in the overall stock market. Our results of operations could be materially negatively affected by economic conditions generally, both in the United States and elsewhere around the world. Continuing concerns over inflation, energy costs, geopolitical issues, the availability and cost of credit, and the U.S. financial markets have contributed to increased volatility and diminished expectations for the economy and the markets going forward. Domestic and international equity markets periodically experience heightened volatility and turmoil. These events may have an adverse effect on us. In the event of a market downturn, our results of operations could be adversely affected by those factors in many ways, including making it more difficult for us to raise funds if necessary, and our stock price may further decline. We cannot provide assurance that our investments are not subject to adverse changes in market value. If our investments experience adverse changes in market value, we may have less capital to fund our operations. We currently lease premises consisting of approximately 16,500 square feet of office and laboratory space in San Diego, leased through June 2019 which serves as our corporate headquarters. Approximately 6,500 square feet of laboratory space is currently subleased. In 2015, we entered into a lease termination agreement to accelerate the expiration date of the lease to April 30, 2016. In February 2016, we received a notice from our current landlord regarding the termination date of our lease and are currently in discussions to resolve any disputes. The Company requires smaller facility space and accordingly entered into a new lease agreement consisting of approximately 4,000 square feet of office space in San Diego. The new lease has an initial term of approximately 7 years and is expected to commence in May 2016. We lease approximately 1,500 square feet of laboratory space located at the Bioscience and Technology Business Center in Lawrence, Kansas, leased through December 2017. We lease approximately 99,000 square feet in three facilities in Cranbury, New Jersey under leases that expire in 2016. We also sublease approximately 11,666 square feet of these facilities with subleases expiring in 2016. We fully vacated these facilities in September 2010. In 2012, a federal securities class action and shareholder derivative lawsuit was filed in Pennsylvania alleging that the Company and its CEO assisted various breaches of fiduciary duties based on our purchase of a licensing interest in a development-stage pharmaceutical program from the Genaera Liquidating Trust in 2010 and our subsequent sale of half of our interest in the transaction to Biotechnology Value Fund, Inc. Plaintiff filed a second amended complaint in February 2015, which we moved to dismiss in March 2015. The district court granted the motion to dismiss on November 11, 2015. The plaintiff has appealed that ruling to the Third Circuit. The Company intends to continue to vigorously defend against the claims against the Company and its CEO. The outcome of the matter is not presently determinable. infringed by Par’s manufacture, use or sale of the product for which the ANDA was submitted. On February 19, 2016, Merck filed an action against Par in the United States District Court for the District of New Jersey, asserting that Par’s manufacture, use or sale of the product for which the ANDA was submitted would infringe Merck’s U.S. Patent No. 9,023,790. The case against Par is captioned Merck Sharpe & Dohme Corp. v. Par Sterile Products, LLC, Par Pharmaceuticals, Inc., Par Pharmaceutical Companies, Inc., and Par Pharmaceutical Holdings, Inc., No.16-cv-00948. As of February 17, 2016, there were approximately 604 holders of record of the common stock. The following table presents information regarding repurchases by us of our common stock during the year ended December 31, 2015 under the stock repurchase program approved by our board of directors in September 2015, under which we may acquire up to $200.0 million of our common stock in open market and negotiated purchases for a period of one year. The graph below shows the five-year cumulative total stockholder return assuming the investment of $100 and is based on the returns of the component companies weighted monthly according to their market capitalizations. The graph compares total stockholder returns of our common stock, of all companies traded on the NASDAQ Stock market, as represented by the NASDAQ Composite® Index, and of the NASDAQ Biotechnology Stock Index, as prepared by The NASDAQ Stock Market Inc. 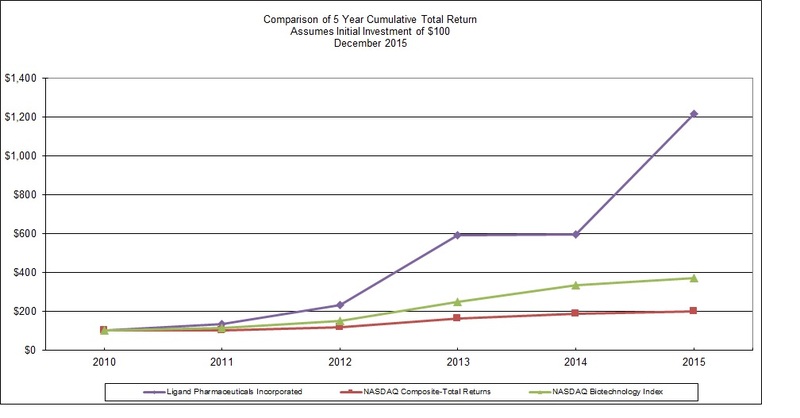 The NASDAQ Biotechnology Stock Index tracks approximately 151 domestic biotechnology stocks. The stockholder return shown on the graph below is not necessarily indicative of future performance and we will not make or endorse any predictions as to future stockholder returns. The following selected historical consolidated financial and other data are qualified by reference to, and should be read in conjunction with, our consolidated financial statements and the related notes thereto appearing elsewhere herein and “Management’s Discussion and Analysis of Financial Condition and Results of Operations.” Our selected statement of operations data set forth below for each of the years ended December 31, 2015, 2014, 2013, 2012, and 2011 and the balance sheet data as of December 31, 2015, 2014, 2013, 2012, and 2011 are derived from our consolidated financial statements. Total revenues for 2015 were $71.9 million compared to $64.5 million in 2014 and $49.0 million in 2013. Our income from continuing operations for 2015 was $229.8 million, or $10.83 per diluted share, compared to income from continuing operations of $12.0 million in 2014, or $0.56 per diluted share, and net income from continuing operations of $8.8 million, or $0.43 per diluted share, in 2013. Royalty revenues were $38.2 million in 2015, compared to $30.0 million in 2014 and $23.6 million in 2013. The increases in royalty revenue of $8.2 million and $6.4 million for the years ended December 31, 2015 and 2014, respectively are primarily due to increases in Promacta and Kyprolis royalties. We recorded material sales of Captisol of $27.7 million in 2015 compared to $28.5 million in 2014 and $19.1 million in 2013. The decrease in material sales of $0.8 million for the year ended December 31, 2015 compared to 2014 is due to timing of customer purchases for Captisol for both clinical and commercial uses. The increase in material sales of $9.4 million for the year ended December 31, 2014 compared to 2013 is due to timing of customer purchases of Captisol as well as an increase in customer purchases for commercial use. We recorded license fees, milestones and other revenues of $6.1 million in 2015 compared to $6.1 million in 2014 and $6.3 million in 2013. The decrease in license fees, milestones and other revenues of $0.2 million for the year ended December 31, 2014, compared to 2013 is primarily due to achievement and timing of milestones as well as licensing payments. Cost of material sales were $5.8 million in 2015 compared to $9.1 million in 2014 and $5.7 million in 2013. The decrease of $3.3 million for the year ended December 31, 2015, compared to the same period in 2014 is due to the mix of Captisol sales and lower cost of goods sold overall. The increase of $3.4 million for the year ended December 31, 2014, compared to 2013 is primarily due to an increase in material sales of Captisol. Research and development expenses for 2015 were $13.4 million compared to $12.1 million in 2014 and $9.3 million in 2013. The increase of $1.3 million is primarily due to the timing of costs associated with internal programs and an increase in non-cash stock based compensation expense. The increase in research and development expenses of $2.8 million for the year ended December 31, 2014 compared to 2013 is primarily due to timing of costs associated with internal programs and an increase in non-cash stock based compensation expense. We are developing several proprietary products. Our programs represent a range of future licensing opportunities to expand our partnered asset portfolio. Our development focus for the year ended December 31, 2015, 2014, and 2013 has been LGD-6972, our novel glucagon receptor antagonist program. We completed a Phase 1b trial in 2015 that demonstrated favorable safety, tolerability and pharmacokinetics and plan to initiate a Phase 2 trial in 2016. General and administrative expenses were $24.4 million for the year ended December 31, 2015 compared to $22.6 million for 2014 and $18.0 million for 2013. The increase of $1.8 million in general and administrative expenses for the year ended December 31, 2015 compared with 2014 is primarily due to an increase in non-cash stock-based compensation and costs incurred for business development activities in 2015. The increase in expenses for the year ended December 31, 2014 compared with 2013 of $4.6 million is primarily due to costs associated with business development activities and an increase in non-cash stock based compensation expense. For the years ended December 31, 2015 and 2014, we had lease exit obligations of $0.9 million and $3.3 million, respectively. The lease exit obligations are related to a facility in Cranbury, New Jersey. The remaining lease obligations run through August 2016. Portions of the facility are subleased with such subleases expiring August 2016. We recorded lease exit and termination costs of $1.0 million for the year ended December 31, 2015, compared to $1.1 million for 2014, and $0.6 million in 2013. Lease exit and termination costs for the years ended December 31, 2015, 2014, and 2013 consisted of accretion costs and adjustments to the liability for lease exit costs due to changes in leasing assumptions. For the years ended December 31, 2015 and December 31, 2014, there was no write-off of IPR&D recorded. For the year ended December 31, 2013, we recorded a non-cash impairment charge of $0.5 million for the write-off of IPR&D for Clopidogrel. Clopidogrel is an IV formulation of the anti-platelet medication designed for situations where the administration of oral platelet inhibitors is not feasible or desirable. Interest expense was $11.8 million for the year ended December 31, 2015 compared to $4.9 million in 2014 and $2.1 million in 2013. The increase in interest expense of $6.9 million for the year ended December 31, 2015 compared with 2014 is due to interest expense and non-cash debt related costs related to the 2019 Convertible Senior Notes, partially offset by a decrease in interest expense related to the term loan facility that we paid off in July 2014. The increase in interest expense of $2.8 million for the year ended December 31, 2014 compared to 2013 was primarily due due to interest expense and non-cash debt related costs related to the 2019 Convertible Senior Notes. We recorded an expense associated with the increase in contingent liabilities of $5.0 million for the year ended December 31, 2015 compared to $5.1 million in 2014 and $3.6 million in 2013. The increase in contingent liabilities for the year ended December 31, 2015 is due to an increase in the fair value of CyDex related contingent liabilities of $3.8 million and an increase in the Metabasis CVRs of $1.2 million. The increase in contingent liabilities for the year ended December 31, 2014 is due to an increase in CyDex related contingent liabilities of $5.7 million, partially offset by a decrease in the fair value of the Metabasis CVR liability of $0.5 million. The increase in contingent liabilities for the year ended December 31, 2013 is due primarily to the increase in the fair value of the Metabasis CVR liability of $4.2 million. This was partially offset by a decrease in the fair value of $0.6 million in CyDex contingent liabilities. We recorded a $28.2 million gain on deconsolidation of Viking for the year ended December 31, 2015, primarily related to the equity milestone received from Viking upon the close of the Viking IPO in addition to the value received upon the underwriters’ exercise of their overallotment option. We recorded a $5.1 million equity in net loss of Viking for the year ended December 31, 2015, for our proportionate share of Viking’s losses based on our ownership of Viking common stock. We recorded other income of $1.8 million for the year ended December 31, 2015 compared to other expense of $1.7 million in 2014 and other income of $0.1 million in 2013. Other income for the year ended December 31, 2015 and 2014 is primarily due to the gain on the sale of short-term investments, partially offset by a decrease in amounts owed to sublicensees. Other expense for 2013 is primarily due to an increase in amounts owed to sublicensees, partially offset by changes in certain liabilities. We recorded an income tax benefit of $192.1 million for the year ended December 31, 2015 compared to an income tax expense from continuing operations of $0.4 million for the year ended December 31, 2014 and an income tax expense of $0.4 million for the year ended December 31, 2013. The income tax benefit for the year ended December 31, 2015 is primarily the result of releasing a valuation allowance against a significant portion of our deferred tax assets. The tax benefit is primarily comprised of U.S. federal and state net operating loss carryforwards, tax credits, and other temporary differences. The income tax expense recognized in 2014 and 2013 is primarily attributable to deferred taxes associated with the amortization of acquired IPR&D assets for tax purposes. On September 6, 2006, we and King Pharmaceuticals, now a subsidiary of Pfizer, entered into a purchase agreement, or the Avinza Purchase Agreement, pursuant to which Pfizer acquired all of our rights in and to Avinza in the United States, its territories and Canada, and to assume certain liabilities as set forth in the Avinza Purchase Agreement. Pursuant to the terms of the Avinza Purchase Agreement, we retained the liability for returns of product from wholesalers that had been sold by us prior to the close of this transaction. Accordingly, as part of the accounting for the gain on the sale of Avinza, we recorded a reserve for Avinza product returns. For the years ended December 31, 2015, 2014 and 2013, we recognized pre-tax gains of $0, $0, and $2.6 million, respectively, due to subsequent changes in certain estimates of assets and liabilities recorded as of the sale date. We recorded $2.4 million as a net loss attributable to noncontrolling interests for the year ended December 31, 2015 compared with $1.1 million for the year ended December 31, 2014. The net loss attributable to noncontrolling interests was recorded as a result of our determination that prior to Viking's IPO we held a variable interest in Viking. We recorded 100% of the losses incurred from May 21, 2014 through deconsolidation of Viking, as net loss attributable to noncontrolling interest due to the fact that we are considered a primary beneficiary with no equity interest in the variable interest entity. Viking was deconsolidated upon IPO and we no longer hold a variable interest in Viking. We have financed our operations through offerings of our equity securities, borrowings from long-term debt, issuance of convertible notes, product sales and the subsequent sales of our commercial assets, royalties, license fees, milestones and other revenues, capital and operating lease transactions. We had net income of $229.8 million for the year ended December 31, 2015. At December 31, 2015, our accumulated deficit was $429.5 million and we had a working capital deficit of $8.1 million. We believe that our currently available funds, cash generated from operations as well as existing sources of and access to financing will be sufficient to fund our anticipated operating, capital requirements and debt service requirement. We expect to build cash in the future as we continue to generate significant cash flow from royalty, license and milestone revenue and Captisol material sales primarily driven by continued increases in Promacta and Kyprolis sales, recent product approvals and regulatory developments, as well as revenue from anticipated new licenses and milestones. In addition, we anticipate that our liquidity needs can be met through other sources, including sales of marketable securities, borrowings through commercial paper and/or syndicated credit facilities and access to other domestic and foreign debt markets and equity markets. We invest our excess cash principally in U.S. government debt securities, investment-grade corporate debt securities and certificates of deposit. We have established guidelines relative to diversification and maturities of our investments in order to provide both safety and liquidity. These guidelines are periodically reviewed and modified to take advantage of trends in yields and interest rates. Additionally, we own certain securities which are classified as short-term investments that we received in December 2012 and June 2014 as a result of an event-based payment and an upfront license payment, respectively, under licenses. We have convertible debt outstanding as of December 31, 2015 related to our 2019 Convertible Senior Notes. In August 2014, we issued $245.0 million aggregate principal amount of convertible senior unsecured notes. The Notes are convertible into common stock upon satisfaction of certain conditions. Interest of 0.75% per year is payable semi-annually on August 15th and February 15th through the maturity of the notes in August 2019. During the year ended December 31, 2015, we repurchased 6,120 common shares at a weighted average price of $79.92 per share pursuant to the repurchase plan, or approximately $0.5 million of common shares. During the year ended December 31, 2014, we repurchased 1,253,425 common shares at a weighted average price of $54.20 per share pursuant to the repurchase plan, or approximately $68.0 million of common shares. In connection with the acquisition of CyDex in January 2011, we issued a series of CVRs and also assumed certain contingent liabilities. We may be required to make additional payments upon achievement of certain clinical and regulatory milestones to the CyDex shareholders and former license holders. In addition, through 2016 we will pay CyDex shareholders 20% of all CyDex-related annual revenue exceeding $15.0 million; plus an additional 10% of all CyDex-related annual revenue exceeding $35.0 million. In connection with the acquisition of Metabasis in January 2010, we entered into four CVR agreements with Metabasis shareholders. The CVRs entitle the holders to cash payments upon the sale or licensing of certain assets and upon the achievement of specified milestones. We lease our office facilities under operating lease arrangements with varying terms through April 2023. The agreements provide for increases in annual rents based on changes in the Consumer Price Index or fixed percentage increases ranging from 3.0% to 3.5%. We also sublease a portion of our facilities through leases which expire in 2016. The sublease agreements provide for a 3% increase in annual rents. We had no off-balance sheet arrangements at December 31, 2015, 2014 and 2013. Purchase obligations represent our commitments under our supply agreement with Hovione for Captisol purchases. Contingent liabilities to former shareholders and licenseholders are subjective and affected by changes in inputs to the valuation model including management’s assumptions regarding revenue volatility, probability of commercialization of products, estimates of timing and probability of achievement of certain revenue thresholds and developmental and regulatory milestones and affect amounts owed to former license holders and CVR holders. As of December 31, 2015, only those liabilities for revenue sharing payments and milestones achieved as a result of 2015 activities are included in the table above. sublease income of $1.4 million through the end of such lease which are not in the table above: $0.3 million within less than one year, $0.9 million within one to two years, and $0.2 million within three years. We are also required under our CyDex CVR Agreement to invest at least $1.5 million per year, inclusive of employee expenses, in the acquired business through 2015. As of December 31, 2015, we exceeded that amount. Operating activities provided cash of $41.7 million, $20.6 million and $20.7 million in 2015, 2014 and 2013, respectively. The cash provided in 2015 reflects net income of $227.4 million and $186.5 million of non-cash items to reconcile the net income to net cash used in operations. These reconciling items primarily reflect a net deferred tax asset of $192.1 million from the release of our valuation allowance, a $28.2 million gain on deconsolidation of Viking, and a $2.6 million gain on the sale of investments. Partially offsetting non-cash change in estimated value of contingent liabilities of $5.0 million, $5.1 million loss on equity investment of Viking, depreciation and amortization of $2.6 million, stock-based compensation of $12.5 million, amortization of debt discount and issuance fees of $10.3 million, and a decrease in the fair value of the Viking convertible note of $0.8 million. The cash provided by operations in 2015 is further impacted by changes in operating assets and liabilities due primarily to a decrease in accounts receivable of $6.5 million and a decrease in restricted cash of $1.3 million. Partially offsetting, other assets increased $0.3 million, accounts payable and accrued liabilities decreased $4.0 million, deferred revenue decreased $2.2 million and inventory increased $0.4 million. The cash provided in 2014 reflects net income of $10.9 million and $20.6 million of non-cash items to reconcile the net income to net cash used in operations. These reconciling items primarily reflect a non-cash change in estimated value of contingent liabilities of $5.1 million, depreciation and amortization of $2.7 million, stock-based compensation of $11.3 million, amortization of debt discount and issuance fees of $3.7 million, accretion of notes payable of $0.2 million, a non-cash milestone payment received of $1.2 million, realized gain on investments of $1.5 million and net deferred tax assets and liabilities of $0.4 million. The cash provided by operations in 2014 is further impacted by changes in operating assets and liabilities due primarily to an increase in accounts receivable of $10.4 million, an increase in other assets of $1.9 million and a decrease in accounts payable and accrued liabilities of $3.2 million. Partially offsetting this, inventory decreased $4.4 million and restricted cash decreased $0.1 million. The cash provided in 2013 reflects net income of $11.4 million, adjusted by $2.6 million of gain from discontinued operations and $13.2 million of non-cash items to reconcile the net income to net cash used in operations. These reconciling items primarily reflect a non-cash change in estimated value of contingent liabilities of $3.6 million, depreciation and amortization of $2.7 million, stock-based compensation of $5.7 million, write-off of in-process research and development $0.5 million, accretion of notes payable of $0.4 million, and net deferred tax assets and liabilities of $0.4 million. The cash provided by operations in 2013 is further impacted by changes in operating assets and liabilities due primarily to a decrease in accounts receivable of $2.4 million, a decrease in inventory of $0.6 million, and a decrease in other assets of $0.1 million. Partially offsetting this, accounts payable and accrued liabilities decreased $2.8 million, other liabilities decreased $0.4 million and deferred revenue decreased $0.7 million. Net cash used in operating activities of discontinued operations was $0.6 million in 2013. Investing activities used cash of $112.9 million, $2.0 million, and $5.0 million in 2015, 2014, and 2013, respectively. Cash used by investing activities in 2015 primarily reflects the purchase of short-term investments of $166.0 million, purchase of Viking common stock of $9.0 million, purchase of commercial license rights of $4.0 million, payments to CyDex CVR holders and other contingency payments of $6.7 million, $0.2 million for a reduction in cash due to deconsolidation of Viking and purchases of property and equipment of $0.1 million. Partially offsetting, investing activities generated proceeds from the maturity of short-term investments of $57.2 million and $16.0 million from the sale of short-term investments. Cash used by investing activities in 2014 primarily reflects the purchase of commercial license rights of $1.0 million and payments to CyDex CVR holders and other contingency payments of $3.5 million, partially offset by proceeds from the sale of short-term investments of $2.3 million and proceeds from the sale of property, building and equipment of $0.1 million. Cash used by investing activities in 2013 primarily reflects the purchase of commercial license rights of $3.6 million, payments to CyDex CVR holders of $1.0 million, and purchases of property, building and equipment of $0.4 million. Financing activities provided cash of $8.4 million and $130.0 million in 2015 and 2014, respectively and used cash of $16.5 million in 2013. Cash provided by financing activities in 2015 primarily reflects the $8.8 million of proceeds received from stock option exercises and our employee stock purchase plan, partially offset by payment for share repurchases of $0.5 million. Cash provided by financing activities in 2014 primarily reflects the gross proceeds received from the issuance of an aggregate $245.0 million of the 2019 Convertible Senior Notes, proceeds from issuance of warrants of $11.6 million, and $4.6 million of proceeds received from stock option exercises and our employee stock purchase plan, partially offset by repayment of debt of $9.4 million, purchase of convertible bond hedge of $48.1 million, payment for share repurchases of $68.0 million and payment of debt issuance costs of $5.7 million. Cash used in financing activities in 2013 primarily reflects the repayment of debt of $19.6 million, partially offset by proceeds of $3.1 million received from stock option exercises and purchases under our employee stock purchase plan. Royalties on sales of products commercialized by our partners are recognized in the quarter reported by the respective partner. Generally, we receive royalty reports from our licensees approximately one quarter in arrears due to the fact that our agreements require partners to report product sales between 30-60 days after the end of the quarter. The Company recognizes royalty revenues when it can reliably estimate such amounts and collectability is reasonably assured. Under this accounting policy, the royalty revenues reported are not based upon estimates and such royalty revenues are typically reported to the Company by its partners in the same period in which payment is received. Revenue from material sales of Captisol is recognized upon transfer of title, which normally passes upon shipment to the customer, provided all other revenue recognition criteria have been met. All product returns are subject to the Company's credit and exchange policy, approval by the Company and a 20% restocking fee. To date, product returns by customers have not been material to net material sales in any related period. The Company records revenue net of product returns, if any, and sales tax collected and remitted to government authorities during the period. Many of the Company's revenue arrangements for Captisol involve a license agreement with the supply of manufactured Captisol product. Licenses may be granted to pharmaceutical companies for the use of Captisol product in the development of pharmaceutical compounds. The supply of the Captisol product may be for all phases of clinical trials and through commercial availability of the host drug or may be limited to certain phases of the clinical trial process. The Company evaluates the deliverables in these agreements to determine whether they have stand-alone value to our customers and therefore meet the criteria to be accounted for as separate units of accounting or they should be combined with other deliverables and accounted for as a single unit of accounting. Management believes that the Company's licenses have stand-alone value at the outset of an arrangement because the customer obtains the right to use Captisol in its formulations without any additional input by the Company. Other nonrefundable, upfront license fees are recognized as revenue upon delivery of the license, if the license is determined to have standalone value that is not dependent on any future performance by the Company under the applicable collaboration agreement. Nonrefundable contingent event-based payments are recognized as revenue when the contingent event is met, which is usually the earlier of when payments are received or collections are assured, provided that it does not require future performance by the Company. Sales-based contingent payments from partners are accounted for similarly to royalties, with revenue recognized upon achievement of the sales targets assuming all other revenue recognition criteria are met. The Company occasionally has sub-license obligations related to arrangements for which it receives license fees, milestones and royalties. The Company evaluates the determination of gross versus net reporting based on each individual agreement. reasonably assured at the inception of the agreement, and the Company has no further performance obligations relating to that event, and (2) collectability is reasonably assured. If these criteria are not met, the milestone payment is recognized over the remaining period of the Company’s performance obligations under the arrangement. We review the carrying value of our finite-lived intangible assets for impairment whenever events or changes in circumstances indicate that the carrying amount of an asset may not be recoverable. If such circumstances exist, an estimate of undiscounted future cash flows to be generated by the long-lived asset is compared to the carrying value to determine whether an impairment exists. If an asset is determined to be impaired, the loss is measured based on the difference between the asset's fair value and its carrying value. As of December 31, 2015, 2014, and 2013 there has been no impairment of finite-lived assets. Indefinite-lived intangible assets, composed of IPR&D assets acquired in a business combination and we have not obtained the regulatory approval for marketing or abandoned the associated research and development effors, are reviewed annually for impairment and whenever events or changes in circumstances that would indicate a reduction in the fair value of the IPR&D projects below their respective carrying amounts. If the asset's carrying value exceeds its fair value, an impairment charge is recorded for the difference and its carrying value is reduced accordingly. Estimating future net cash flows of an IPR&D assets for purposes of an impairment analysis requires us to make significant estimates and assumptions regarding the the amount, timing and probability of achieving revenues from various regulatory milestone events and the completed product for the projects we licensed to partners, as well as amount and timing of costs to complete for projects we currently develop independently. Consequently, the eventual realized value of an acquired IPR&D asset may vary from its estimated fair value at the date of acquisition, and IPR&D impairment charges may occur in future periods which could have a material adverse effect on our results of operations. As of December 31, 2015 and 2014, there has been no impairment of IPR&D assets. We recorded $0.5 million impairment to one of the IPR&D assets in 2013. Similar to IPR&D assets, we perform an impairment analysis for goodwill on at least an annual basis, usually as of December 31 of each year, absent any indicators of earlier impairment. We use the income approach and the market approach, each weighted at 50%, for goodwill impairment analysis. For the income approach, we consider the present value of future cash flows and the carrying value of its assets and liabilities, including goodwill. The market approach is based on an analysis of revenue multiples of guideline public companies. If the carrying value of the assets and liabilities, including goodwill, were to exceed our estimation of the fair value, we would record an impairment charge in an amount equal to the excess of the carrying value of goodwill over the implied fair value of the goodwill. As of December 31, 2015, 2014, and 2013 there has been no impairment of goodwill. In connection with our acquisition of CyDex in January 2011, we recorded contingent liabilities for amounts potentially due to holders of the CyDex CVR's and certain other contingency payments. The fair value of the liability is assessed at each reporting date using the income approach incorporating the estimated future cash flows from potential milestones and revenue sharing. The change in fair value is recorded in our consolidated statements of operations. The carrying amount of the liability may fluctuate significantly and actual amounts paid may be materially different than the carrying amount of the liability. In connection with our acquisition of Metabasis in January 2010, we issued Metabasis stockholders four tradable CVRs, one CVR from each of four respective series of CVR, for each Metabasis share. The CVRs entitle Metabasis stockholders to cash payments as proceed is received by us from the sale or partnering of any of the Metabasis drug development programs. The fair values of the CVRs are remeasured at each reporting date through the term of the related agreement. Changes in the fair values are reported in the statement of operations as income (decreases) or expense (increases). The carrying amount of the liability may fluctuate significantly based upon quoted market prices and actual amounts paid under the agreements may be materially different than the carrying amount of the liability. valuation allowance in accordance with the authoritative guidance relating to income taxes under ASC 740, Income Taxes, which requires an assessment of both positive and negative evidence that is available regarding the reliability of these deferred tax assets, when measuring the need for a valuation allowance. Developing the provision for income taxes requires significant judgment and expertise in federal and state income tax laws, regulations and strategies, including the determination of deferred tax assets and liabilities and, if necessary, any valuation allowances that may be required for deferred tax assets. The Company's judgments and tax strategies are subject to audit by various taxing authorities. While management believes the Company has provided adequately for its income tax liabilities in its consolidated financial statements, adverse determinations by these taxing authorities could have a material adverse effect on the Company's consolidated financial condition and results of operations. Stock-based compensation cost for awards to employees and non-employee directors is recognized on a straight-line basis over the vesting period until the last tranche vests. We identify an entity as a variable interest entity, or VIE, if either: (1) the entity does not have sufficient equity investment at risk to permit the entity to finance its activities without additional subordinated financial support, or (2) the entity's equity investors lack the essential characteristics of a controlling financial interest. If the Company is no longer the primary of a VIE or the entity is no longer considered as a VIE as facts and circumstances changed, it deconsolidates the entity under the applicable accounting guidance. When perform the analysis for certain transaction such as our investment in Viking (Refer to Note 2 to the consolidated financials for details), the Company considered certain criteria, including risk and reward sharing, experience and financial condition of its partner, voting rights, involvement in day-to-day operating decisions, the Company’s representation on the entity's executive committee, and level of economics between the Company and the entity. At December 31, 2015, our investment portfolio included investments in available-for-sale equity securities of $102.8 million. These securities are subject to market risk and may decline in value based on market conditions. term of the 2019 Convertible Senior Notes, the notes may have a dilutive effect on our earnings per share to the extent the stock price exceeds the conversion price of the notes. Additionally, the warrants may have a dilutive effect on our earnings per share to the extent the stock price exceeds the strike price of the warrants. We purchase Captisol from Hovione, located in Lisbon, Portugal. Payments to Hovione are denominated and paid in U.S. dollars; however the unit price of Captisol contains an adjustment factor which is based on the sharing of foreign currency risk between the two parties. The effect of an immediate 10% change in foreign exchange rates would not have a material impact on our financial condition, results of operations or cash flows. We do not currently hedge our exposures to foreign currency fluctuations. We have audited the accompanying consolidated balance sheets of Ligand Pharmaceuticals Incorporated (the “Company”) as of December 31, 2015 and 2014, and the related consolidated statements of operations, comprehensive income (loss), changes in shareholders’ equity (deficit), and cash flows for each of the three years in the period ended December 31, 2015. These financial statements are the responsibility of the Company’s management. Our responsibility is to express an opinion on these financial statements based on our audits. In our opinion, the consolidated financial statements referred to above present fairly, in all material respects, the financial position of Ligand Pharmaceuticals Incorporated as of December 31, 2015 and 2014, and the results of its operations and its cash flows for each of the three years in the period ended December 31, 2015 in conformity with accounting principles generally accepted in the United States of America. As discussed in Note 1, the 2015 consolidated financial statements have been restated to correct errors. We also have audited, in accordance with the standards of the Public Company Accounting Oversight Board (United States), the Company’s internal control over financial reporting as of December 31, 2015, based on criteria established in the 2013 Internal Control-Integrated Framework issued by the Committee of Sponsoring Organizations of the Treadway Commission (COSO), and our report dated February 26, 2016 (except for the material weaknesses discussed in the Management’s Report on Internal Control over Financial Reporting, as to which the date is November 14, 2016) expressed an adverse opinion.